It was Summer of 1993. I was working 70 hour weeks at New York City law firm. I had a wife and a one year old child, and life was pretty busy. In spite of this, I was headed off to the Bugaboos with Jeremy. This was to be our second big climbing trip together. 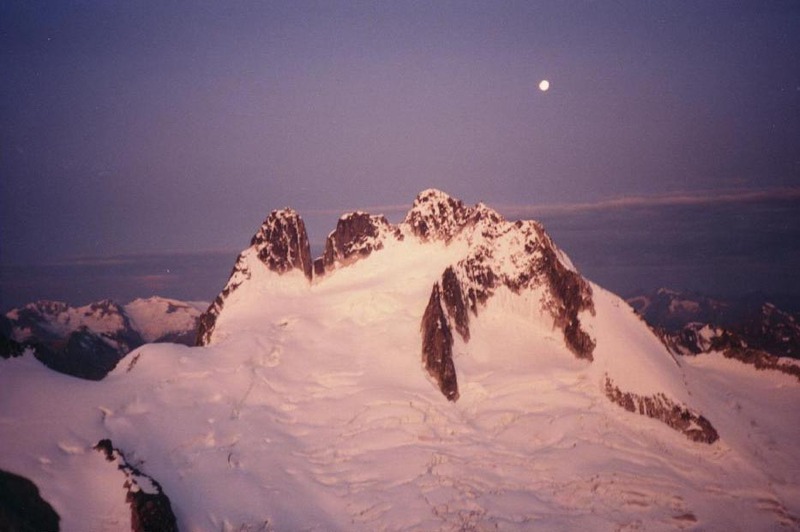 A lot had happened since my first climbing trip with Jeremy on the Exum Ridge. I had become softer, balder, and between family, church responsibilities, my job, and the pressures of living in New York, had little time to climb. Jeremy, on the other hand, was now almost a full-time climber. I had been sure that our frightening experience on the Grand Teton would have convinced him to give up climbing forever, but it apparently had just the opposite effect. His life was pretty much centered on climbing now, and he was regularly flashing routes I would never be capable of climbing. I still had a bit more experience in the alpine arena, however, so I still contributed some competence to our endeavor, or at least, that's what I told myself. 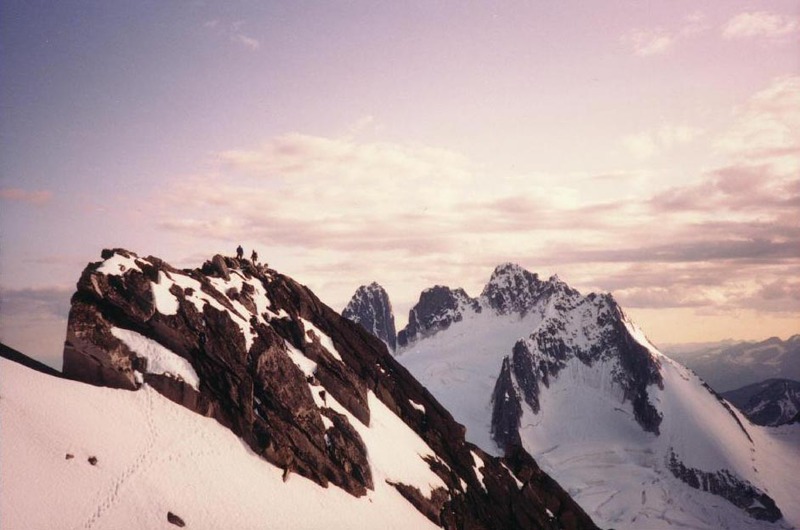 We were headed up to the Bugaboos for a week and a half. 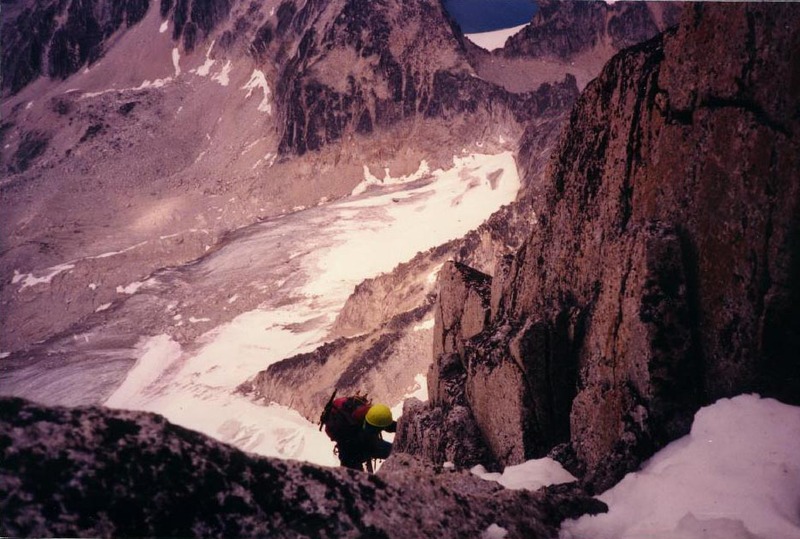 Our goal was to climb the North-East ridge of Bugaboo Spire, and perhaps the West Ridge of Pigeon or the South-East Shoulder of Snowpatch. We also wanted to take a peek at the Beckey/Chouinard on South Howser tower, but didn't have serious designs on that route. I met Jeremy at the airport in Spokane, and we bundled our gear into the rental car and headed off for the Great White North. It was an uneventful and somewhat boring trip up to the border. When we reached the border, the guard there questioned us at length about our ability to support ourselves while we were in Canada, but let us go at last, finally convinced that we weren't going to be a drain on Canada's welfare state. We drove North through the night along largely deserted roads. We fought a constant battle with the car radio, which received fewer and fewer stations the farther North we drove. Finally, the only station we could get was a Canadian government public radio station. At first the programming consisted of classical music, which was o.k., but then they entered into a three hour block of "mouth music", which consisted of semi-musical rhythmic nonsense noises "sung" in a chanting fashion: "Humnunna humna humnunna humna thssspzz thssspzz, Humnunna, humnunna thssspzz thssspz; Kkkqqqaach, kkkqqqaach baaa baaa thssspzz thssspzz." Well before the three hour radio show's conclusion, we were longing for some Stone Temple Pilots to clear our heads of the strange "mouth music," which was sounding a lot like a collaboration between a class of kindergarteners blowing raspberries, and a cloister of demented Gregorian monks with speech impediments. The radio show was certainly an eloquent argument against government involvement in popular entertainment. We found the turn off to the dirt logging road that leads to the Bugaboos, and drove along in the darkness. It was raining sporadically, and there was a large electrical storm going on overhead. All at once, in the flash of lightning, we saw spires illuminated against the black sky. I stopped, and we watched for a few minutes as jagged tendrils of lightning arced through the sky, hammering the towers. "Geeze! Glad we're not up there!" was our mutual reaction. We kept on driving, and then suddenly there was a pack of wolves in our headlights. There were about 8 or 9 of them, and they stood in the road, staring at our car, their eyes reflecting back at us. Then they took off, running into the forest. It was a thrilling sight, and the lightning lashed towers coupled with the wild wolf pack gave us a real sense that we were in for a thoroughly uncivilized experience. We drove on until we reached the trailhead, and spent the rest of the night dozing in our car. When morning came, we packed up our stuff, and used chicken wire and large sticks (which were stored in a nearby shed) to wrap up our car to protect it from hungry animals that like to chew on rubber and plastic. We then shouldered our extremely heavy packs and headed up the trail to the Kain hut. The approach to the Kain hut was probably the steepest maintained trail I have ever hiked. We were both relieved and exhausted when we finally reached the Kain hut. The hut was large and comfortable, and we spent the rest of the day there. 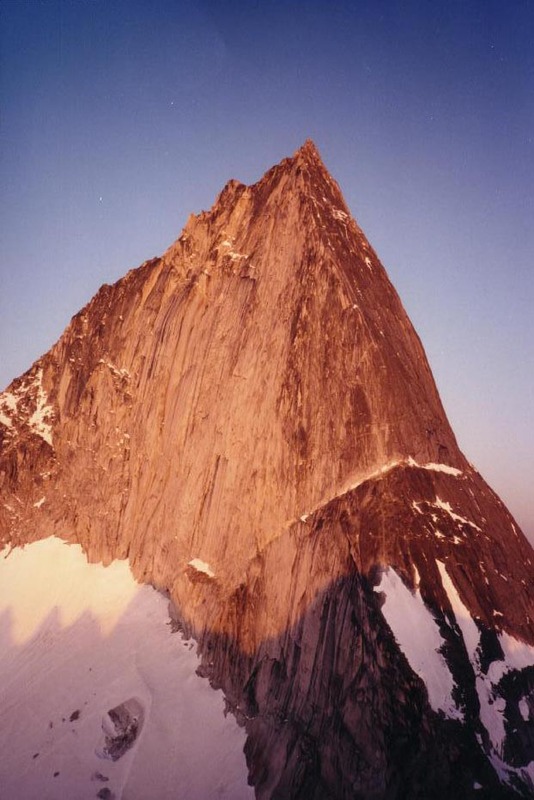 Our plan was to head out early the next morning and climb the 5.4 West Ridge of Pigeon Spire, as a warm up to our climb of Bugaboo's North East Ridge. It rained hard that afternoon, and snowed a little, but by the time we went to sleep, the skies had cleared. We woke up early the next morning and headed up to the Bugaboo/Snowpatch col on our way to Pigeon Spire. The approach to the col involves ascending a small stretch of glacier, which we began heading up, kicking steps and using our ice axes for balance. We were roped up, but did not feel the need to place any sort of protection. About 2/3 of the way up the glacier, I heard a shout and felt a tug on the rope. I looked back to discover that Jeremy had fallen up to his armpits in a small crevasse. I put some tension on the rope, and he was finally able to crawl out and extricate himself from the crevasse. Apparently, he had broken through a snow bridge and his feet were touching nothing, just swinging around over empty space. Spooky! Jeremy: "Hmm, I don't like the looks of that, you can't tell where the crevasses are." Kai: "Yes, looks pretty dangerous. I guess we might be able to try crossing it, as long as we were roped up, but I don't know." Jeremy: "Do you have any experience with glacier travel or crevasse rescue?" Kai: "No, not really, but I did read a book on the subject once, what about you?" Jeremy: "It wasn't fun falling in that crevasse on the way up here, and that one was tiny." Kai: "Yup, maybe we should just bag it." Jeremy: "Yes, maybe we should." With that, we settled down for a leisurely bout of eating, drinking and picture taking. It was a bit disappointing to abandon our goal, but we were relieved that we wouldn't be practicing our non-existent glacier crossing skills on the blank expanse below us. We eventually headed back to the Kain Hut, and packed up our gear for the trek up to Appleby dome, where we planned on setting up our permanent camp. We found a good spot for our tent at Appleby dome and spent the next few days waiting out bad weather, a mixture of rain, snow, and sleet. There wasn't much to do during this time except cook, eat and occasionally climb on the boulders scattered around near our camp site. Finally, the weather cleared and we decided that it was time to try for Bugaboo Spire's North East Ridge. We had been scoping out the route for the past several days, and were itching to give it a shot. We woke up early and did the approach by headlamp. We lost some time getting up to the base of the route due to some wrong turns scrambling up the approach gullies, but finally got to the beginning of the technical climbing an hour or so after sunrise, with only one party ahead of us. We burned more time waiting for the party ahead of us to get established on the route, but then, finally, we were off and climbing. The climbing was fun for the most part. The first few pitches were the hardest, climbing up cracks and flakes, but the climbing wasn't all that difficult. We finally got established on the ridge proper, and moved a little faster. At one point, we were delayed a bit by a crack that was choked with snow and ice and melting water, but Jeremy gallantly led that pitch, and we were off and climbing again. We were approaching the summit on relatively easy ground, when we heard the sound of distant thunder. We saw some dark clouds in the distance, which began to give us a rising level of anxiety, particularly as we had witnessed a number of electrical storms over the last few days. It didn't take a genius to know that Bugaboo Spire was not the place to be in the middle of a big lightning storm. We tried to move more quickly, and climbed faster, one eye on the threatening clouds. We finally reached the blocky summit of the Spire. We hadn't heard thunder in a while, but we didn't linger long, as it was already late afternoon. Just a couple of pictures, then we headed down. We found the descent route, which involved a short traverse and rappel, and began our downward climb. Almost immediately, we were faced with a scary obstacle, a broad low angle slab covered with wet snow. Our route clearly lay across the slab, as there were several tracks traversing it, however it was about one hundred feet across, with no opportunities for placing intermediate protection. On the far side of the slab was a notch in the rock, also covered with wet snow, that would need to be climbed to regain the descent ridge. A slip while traversing would lead to a nasty pendulum swing of a hundred feet or more, probably impacting several rock slabs on the way. We were tired and a bit drained. We had already reached the summit. We were not mentally prepared for this, as we had expected the climbing to be easy from here on out. We fretted for a while, trying to figure out an alternative to the traverse. We finally decided to go for it. I can't remember who went across first, and really, it didn't much matter who went first, as both the leader and the follower were exposed to a nasty pendulum fall. However, I vividly remember venturing out across the snow, which settled and slipped un-nervingly under my feet. I was sure that with my next step, the snow would lose all cohesion with the rock, and slide, taking me with it for a nasty 100 foot pendulum swing. I finally reached the other side safely, and we got back on the Kain ridge, which was our descent route. Once on the ridge, the climbing was pretty easy, and we moved together for the most part, weaving the ropes in and out of rock horns for protection. Occasionally, we would stop and belay, but mostly we simply simulclimbed down the Kain route. 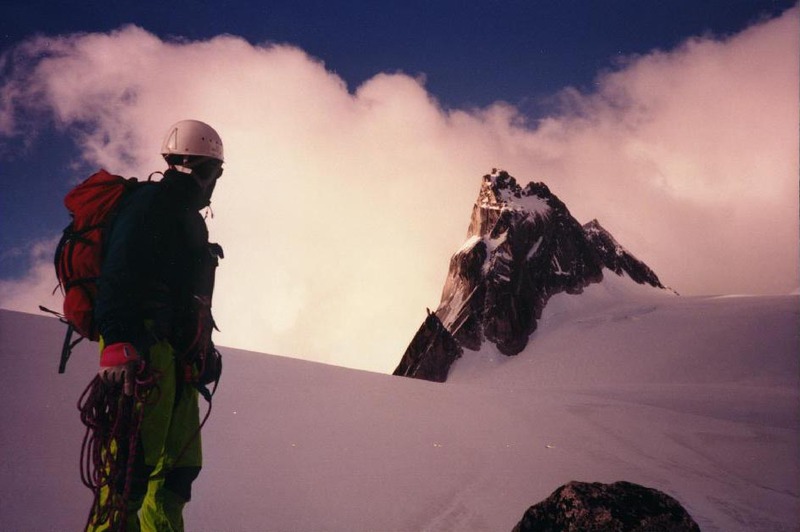 By the time we reached the great gendarme, the light was failing, and after the rappel, we began to consider that we could either continue the descent by headlamp or we could search out a comfortable bivi spot. The sky was clear, with no apparent threat of bad weather, and we decided to stop for the night, and continue on the next morning. We found a comfortable flat spot, and settled in for a night out on the mountain. We were treated to a spectacular moonrise over the Howser towers. The night was relatively warm, without a breath of wind or even any clouds. We had no bivi gear other than our clothes, but we piled our ropes under our butts, stuffed our legs into our packs, pulled on our puffy jackets and prepared for a long night. Suddenly, Jeremy, who had been chewing on a Power Bar, gave a yell: "Hey, there's something here. It just stole my Power Bar!" We turned on our headlamps, and the light caught on a rodent, the size of a large rat, with Howdy-Doodie ears, and bulging eyes, sitting up on a rock, chewing on Jeremy's Power Bar. Jeremy had laid it down to get a drink, and the creature had stolen it while he wasn't looking. We laughed a little at our encounter with the snafflehound (as I believe these creatures are called) and settled back down to try and get to sleep. I was drifting off, when I heard a metallic clinking sound. I looked down and saw the snafflehound dragging away one of my slings with two carabiners attached. I yelled and swung my arm at the kleptomaniac creature, and it dropped the sling and disappeared into some rocks. We then proceeded to gather up all the loose gear and stuff it in the packs, away from the clutches of the snafflehound. He would not give up, however, and a little while later, I noticed the stealthy creature was back, and this time he was beginning to gnaw on the rope which was stacked under my legs. Attacking our rope was an act of war, and Jeremy and I armed ourselves with rocks, and prepared to defend our gear. We put out another piece of Power Bar on a rock, and waited for the beast to appear. He did appear, and blithely made off with the Power Bar bait, as our rock missiles flew harmlessly past him. The rest of the night was more of the same, with the snafflehound chewing on ropes, packs, and even Jeremy's boot, while we did our best to rid ourselves of this pest, chasing him, throwing rocks, kicking, whipping ropes at him, all to no avail. More than once, we were sure that we had knocked him off the ledge into the abyss, but he always re-appeared, tenacious as ever. We finally gave up, and fell into a fitful sleep, our ropes inside of our packs to protect them from the evil creature's predations. The next morning, we carefully inspected our ropes, then proceeded with our descent of the Kain route. It was a beautiful day, and soon the sun was shining down on us. We were out of water, however, and by the time we reached the Bugaboo/Snowpatch col, we were very thirsty. We descended the glacier, and walked back down to Appleby dome and our campsite. When we arrived at our camp, we drank and ate in large amounts, and then collapsed in our tent and slept all the rest of that day and through the night. When we finally woke up, we decided to take the day off, and spent the day washing, bathing, eating, and bouldering. We had our eye on the South East Shoulder of Snowpatch Spire now, and determined that we would give it a try the next morning. Heavy weather moved in again, however, and we woke up to rain and sleet. We spent the next day doing nothing, with the weather worsening. Big snow slides were rumbling off of Snowpatch, and we began to lose our enthusiasm for the route. When the next day dawned with no improvement in the weather, we finally decided that what we truly needed was a deep dish pizza, and so we packed up our gear, broke camp, and headed back down the steep trail to the car. After what seemed like a truly unending hike, we finally reached our car, and drove back to civilization. In Radium Hot Springs, we found a truly excellent pizza restaurant. We ate the pizza with gusto, and tipped the waitress heavily for serving us politely, in spite of our stench, the result of too much sweat, grime, and mosquito repellent. On the drive back to Spokane, we listened to strange avant guard drama on the Canadian public radio station. We weren't sure what the plot of the radio show was about, but it involved lots of guttural yelling and animal noises. The highlight of the trip back was our stay at a cheap hotel, where we got a hot shower. Jeremy and I parted at the airport. I was sad to be going back to my life as an over-worked lawyer, but was happy to be headed back to my family again. Anyway, I was sure I would be coming back to the Bugaboos again. Jeremy and I had promised each other that we would be back to climb Snowpatch, and maybe even the Beckey/Chouinard on South Howser Tower. 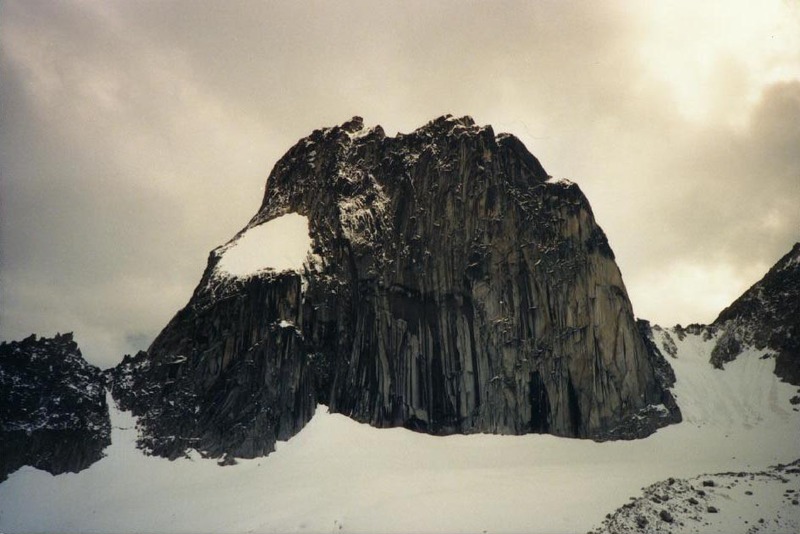 Having been to the Bugaboos and seen it and experienced it, I realized that one visit would not be enough.